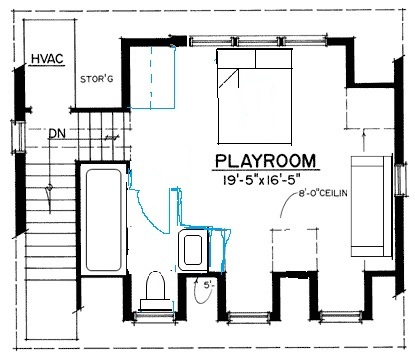 This is a Carriage House Plan Review for a plan with 2 garages. To take a look at the original click on over to Architectural Designs. It's described as a 'man cave' and for this review I wanted to see how a few changes could make this space into a guest house. First of all I love the atmosphere of a carriage house plan with its sloping ceilings and dormer windows. I think they create a really cozy feeling - ideal for a guest house. And if you install a separate HVAC system you can just fire it up when someone's coming over to stay. Of course there's no reason it wouldn't do for a great teenager's layer as well. So - What changes did I make? I enlarged the bathroom - it's an unusual shape but keeping the door facing out into the middle of the room seemed important for the quality of the space to the right of the bathroom. I moved the windows at the top of the floor plan along and added another dormer - Or maybe you could stay with the same number of dormers so as not to increase costs and have some translucent glass put in as the bathroom walls to let the light from the bathroom dormer flow through. The little cut out in the bathroom taken by the sink creates a perfect alcove to put a TV on the wall on a wall bracket so you can watch from the sofa and the bed. There would be room for another chair and a coffee table and a desk or locker beside the bed or above the sofa in the picture. So that's it for this carriage house plan review. I didn't bother reviewing the lower floor because it's a garage. The position of the stairs has to remain the same so that there's no banged heads at the top of the stairs. Check out his 3 door carriage house plan. A full on guest apartment above a garage block. Back to the top of this carriage house plan review page.